Join our growing and vibrant community of ASC members and receive substantial discounts on all events and activities we run - plus free entry to the ASC Circles (monthly songwriter gatherings), free and exclusive access to our 'Members Lounge' and other special perks just for members! The membership fee is great value at just $150.00 for 12 months. That is equal to the cost of attending ASC Circles for the same period, and you get so much more than that as an ASC Member. So fast-track your songwriting and music career by joining today! 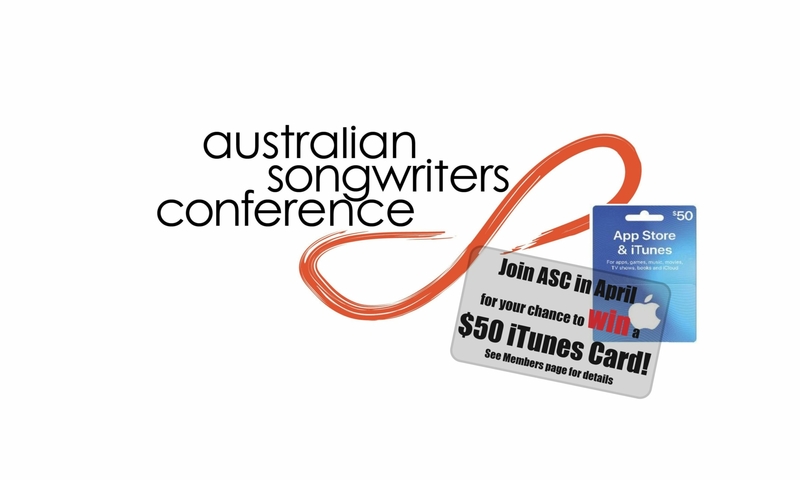 Go in the draw to WIN a $50 iTunes Card when you join the ASC in April! Become an ASC Member during the month of April 2019 and you automatically go in the draw for your chance to win an Apple 'App Store & iTunes' Card valued at $50! Join now to go in the draw! Terms & Conditions: All new members who join the ASC Members Program between 12am, 1 April 2019 and 11.59, 30 April 2019 (AEST) will be automatically entered into the draw. The winner will be drawn at 12pm (AEST) on 1 May 2019. The winner will be notified by email or telephone directly following the draw. The winner will be announced on the ASC website and ASC social media sites. A photo of the winner will be requested to accompany the announcements on the website and social media. This promotion is being run by the Australian Songwriters Conference and is in no way sponsored, endorsed or administered by, or associated with Apple Pty Ltd.